Nothing comes for free. True in business and often true in biology. The pleiotropic function of TEP1 genes in mosquito immunity and reproduction suggests that there is a significant cost to male reproductive success associated with enhanced female parasite resistance. Even in the simplest of organisms, helpful traits often come at the cost of others. These relationships may be the result of resource allocation. For example, a bacteria might use energy to pump an antibiotic drug out of the cell at the expense of replication. They can also be the result of physiological constraints, as when an immune pathway results in increased production of molecules that cause oxidative damage and shorten lifespan. A particularly interesting form of trade-off relates to the very genetic architecture of an organism. Antagonistic pleiotrophy occurs when a single gene controls more than one trait. One or more of these traits increases overall fitness and one or more of them decreases overall fitness. It now looks as though an antagonistic pleiotrophy may in part explain the maintenance of malaria susceptibility in mosquito populations. Theioester- containing proteins (TEPs) are postulated to function in the insect immune response in a manner analogous to the function of complement factors in vertebrates. They mark pathogens for the immune system. Marked cells are then destroyed by other components of the immune response (phagocytosis or cell lysis). Exploration of the Anopheles genome has revealed that these mosquitoes have several TEPs. One in particular, TEP1 has been implicated in the mosquito immune response to several pathogens including malaria parasites. This protein is secreted into the mosquito circulatory system in response to wounding or pathogen exposure. When malaria gametocytes are taken up into the mosquito with a blood meal they undergo a sequence of events culminating in sexual reproduction. The product of gamete fusion is a motile ookinete. In lines where researchers have knocked out TEP1, females end up with 5 times more malaria parasites successfully developing in the midgut than controls. What has always seemed a bit strange is that there are four allelic classes or forms of TEP1 in natural populations of mosquitoes. Some of these confer resistance to malaria and others render the mosquito susceptible. Why don’t all females carry the resistant forms of TEP1? It seems in a world filled with pathogens that having daughters best equipped to fight infection would be heavily selected for. Pompon and Levashina recently asked a fantastic question. What about the sons that carry this form of TEP1? They looked for TEP1 in males using florescent tags and they found it, but in a very surprising place: the testes. By looking at the presence of TEP1 over the course of male development and in males just after mating, they narrowed this association down to developing sperm cells. 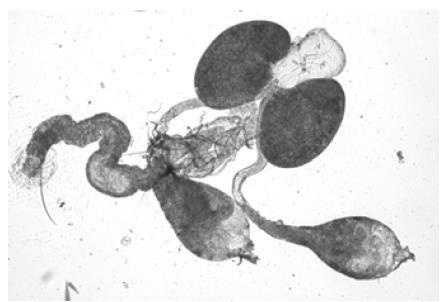 What was a protein involved with targeting pathogens doing in the testes binding to sperm? Anopheles male accessory glands and testes. Taken from MRH Handbook in Anopheles research. Based on their work on the female immune response, Pompon and Levashina hypothesized that TEP1 might target defective sperm in the male testes in the same way it targets parasites in the female midgut. They found that damaging sperm using radiation increased the proportion of TEP1 tagged sperm cells. When normal males were exposed to radiation the proportion of damaged sperm cells decreased with time. In males in which TEP1 was knocked down, the proportion remained high over time. This accumulation of dead sperm had real life consequences. When males with high proportions of dead sperm mated, their eggs had significantly lower hatching rates. These experiments suggested that TEP1 played an important role in male fertility, but the evidence came from males exposed to radiation, hardly a natural state for a male mosquito. To determine how TEP1 might be influencing male fertility in more “normal” conditions, the researchers looked at defective sperm and fertility in lines carrying the different naturally occurring allelic classes of TEP1. Males carrying resistant alleles where more likely to have defective sperm accumulate than susceptible males. Again, this accumulation decreased hatching rates. The offspring of males carrying resistant forms had signifncantly lower hatching rates than those of susceptible males. In other words, while resistant parents may produce daughters with greater resistance to malaria, they also produce sons that are more likely to “shoot blanks”. Pleiotropic function of TEP1 genes in immunity and reproduction likely contributes to the maintenance of susceptible alleles in natural populations. This suggests that there is a significant cost to male reproductive success associated with enhanced female parasite resistance. Several new control strategies are under development which involve genetically engineering malaria resistant mosquito strains (population replacement). This involves manipulating traits contributing to resistance in the laboratory and releasing males into the field. Ideally, we would release males that will produce daughters that resist malaria infection and sons that are competitive for wild female mates. This study highlights that the interconnectedness of reproduction and immunity should be considered in the creation of these lines. Lauren is a Lecturer the Silwood Park Campus of Imperial College London. She is broadly interested in the behavioural ecology of medically important mosquitoes. Current research interests include sexual selection in mosquito swarms, the effect of infection on vector behaviour, and how incorporating vector behaviour into our understanding of transmission dynamics will improve our ability to understand and control disease.